purchase history and on this is a link to the parcel tracking (click on the despatch date). 3. What are the postage costs? These dates are Royal mail and Parcel force dates, we will post on the correct service but cannot guarantee they will do their job. Open as normal from January 2nd! If you do send it to us please include a note of your name, address, tel num, why you are sending it to us. 8. Can I send you my ukara form? YES and its FREE to add you and you dont need to buy a gun. We can add you to the database. We can now only accept posted paper forms and suggest you take a copy befor eposting it to us. We also sell clear guns that do not require spraying, we will still require proof of age. Please supply a list of pat numbers that you require sometimes it tales up to 3 months to get the parts and we will require a deposit paying before the items are ordered. 11, Where can I find gun diagrams? we are gradually building up a list of sites for manuals. Cheque and Postal Order- make payable to Firesupport Ltd and post it to us. Bank Transfer we email you a quote and an bank details. 13. If you are considering buying a Gun, RIF or IF and fps is important (high or low) please add a comment to your order during the checkout process. We cannot guarantee fps of most brands as they vary between batches of production. 16. 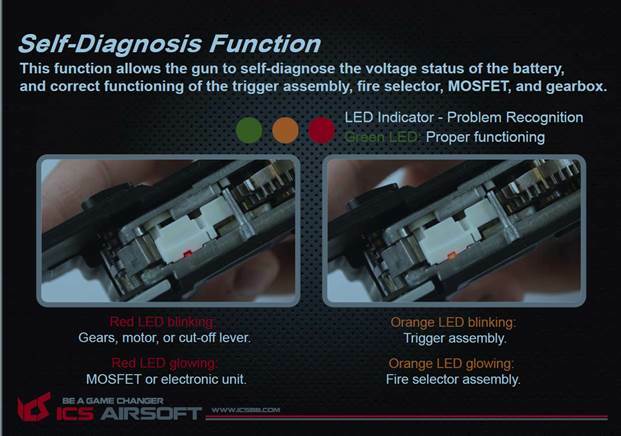 If you require a a different connector on your battery, please add it to your order and add a comment in the comment box toi say please fit connector to battery. We fit it free of charges. 17. New search facility, search for an item then click REFINE to alter your search. 18. If you want a battery with a particular type of connector (Deans or Tamiya), then add the connector you want to your order and in the comments of the order ask us to put the connector on the battery for you, we add £2 labour to the invoice total for doing the work. 19.Let us tell you when a product is back in stock "Click Add to Notify List"
For any out of stock product, click "Add to notify list"
You will then be able to manage your notify list using the My Account link. plastic version the motor is an infinite 2000 instead of the turbo 3000 that is in the metal bodied gun. That does not mean the motor is no good as it was originally in the metal gun until they upgraded the motor in the metal gun. 21. Has my fuse blown? 23. Gas Guns and the Cold. For standard ICS M4 AEG, you need to use MA-60/61/62. The difference between MA-61 and MA-62 is the wire direction. 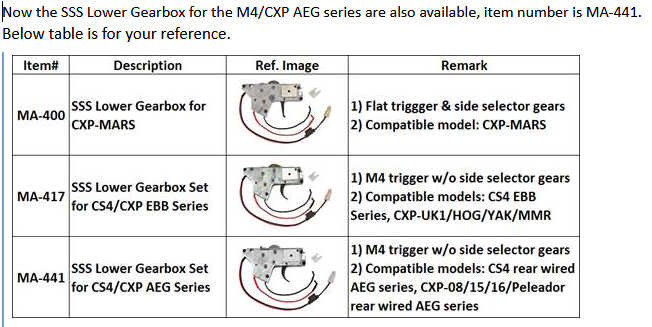 For CXP-UK1/HOG, they use the same upper and lower gearboxes. However, we only have front wired lower gearbox part number for UK1/HOG, if you need the rear wired version, please let me know when you place order. I will change it for you. For PAR Mk3, due to different dimension to the lower receiver, it has a different lower gearbox. 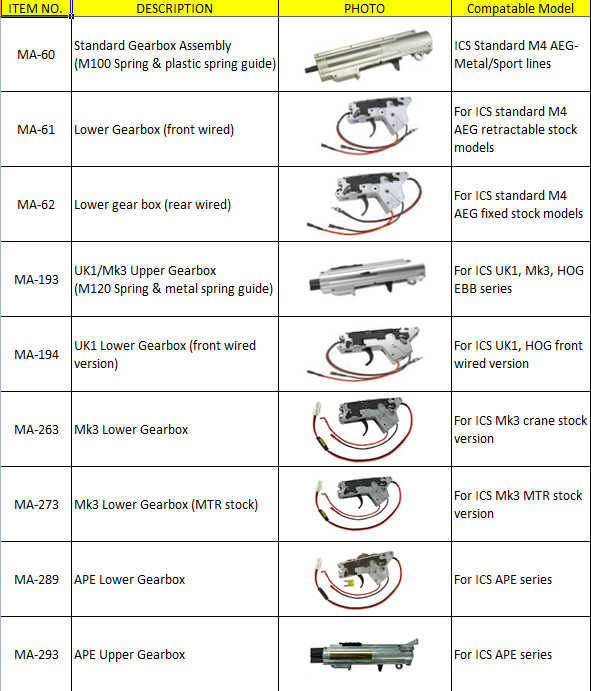 MA-263 and MA-273 actually are the same gearbox with rear wire, but the wire length is different, so they have their individual part number for crane stock or MTR stock. However, the upper gearbox is the same as UK1 and HOG. For APE, it has its own upper and lower gearbox. Though the upper gearbox is mainly the same as the UK1, but it has its own decorated bolt cover, positioning block and nozzle. So APE has its own upper gearbox. To avoid joule creep guns are upgraded and tested using the bb weight that the customer says they will be using. Double check the gears, motor, or cut-off lever if it’s blinking.